While Donald Trump's "America First" agenda is among the most polarizing in U.S. history, there's rare consensus on both sides of the aisle that on one issue where America is "first," we're losing. The United States incarcerates more people per capita than virtually any other country in the world. 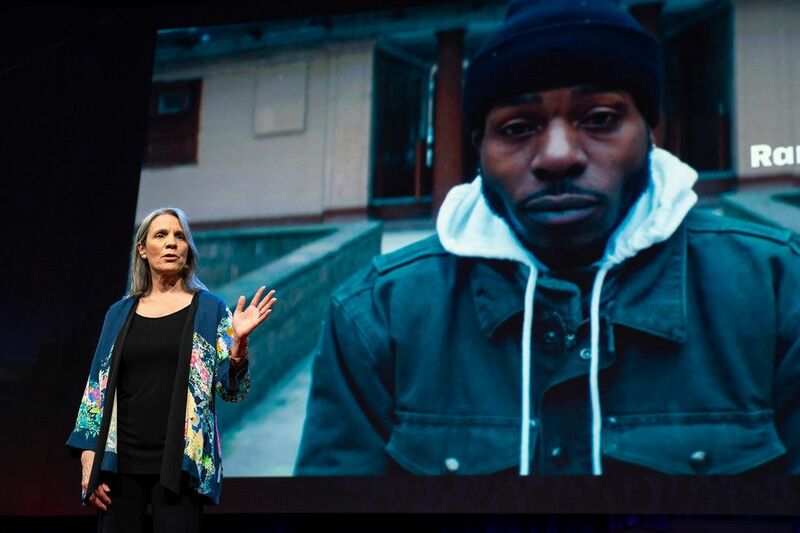 Robin Steinberg, CEO of The Bail Project and founder of The Bronx Defenders, put it simply last night at her TED talk in Vancouver: "America is addicted to imprisonment." And while the underlying causes of mass incarceration are complex and oft-debated — ranging from policing practices to laws that disproportionately target minorities — Steinberg believes there's a simple solution to drastically reducing the number of people in prison: end cash bail. The Bail Project is setting out to do just that, and it's being helped by some share of $400+ million fund called The Audacious Project, launched yesterday at TED2018. The Project is granting funds to five big ideas announced on the TED stage. The funds The Bail Project receives will act as seed money to accelerate the organization's development and reach, and they're needed urgently. Every night half a million people go to sleep in jail who have not been convicted of anything. Often charged with misdemeanor crimes like jumping a turnstile or riding a bicycle on the sidewalk, the book is thrown at them, charges like resisting arrest are added, and bail is increased. To many of these prisoners — who too often choose between breakfast and the cost of a Metrocard — posting a $500 bail is an impossible task. "America is addicted to imprisonment." And their inability to post bail can ruin their life. Steinberg says, "After even a few days in prison you can lose your job; lose your home; lose your immigration status. The state can even take away your children. Not only that, almost half of all jail deaths, including suicides, occur within the first week [of imprisonment]." As if being in prison before a conviction isn't traumatic enough, being held on bail significantly increases the chances you will eventually be convicted. You're four times more likely to receive a jail sentence than if you're at liberty; and when bail money is set, Black and Latino people are two times more likely to remain in jail than if you're white. What does this mean practically? It means that innocent people, largely poor people and people of color, are pleading guilty every day. They're pleading guilty to crimes they didn't commit. The bail system was created to be a form of conditional release. Steinberg says the theory was simple: "Set bail at an amount a person can afford to pay and they will have an incentive to come back to court — some skin in the game." But that theory has been bastardized to create, "A two-tier system of justice — one for the rich and one for everyone else." Steinberg, a long time public defender, was eating Chinese takeout with her husband (also a public defender) one night bemoaning this broken system when he surfaced an idea: Start a bail fund to bail their own clients out of jail. To many, the idea was crazy — they warned Steinberg that without their money at stake, clients wouldn't show up to court and the money would be lost. But Steinberg and her team persisted. If the idea did work and clients returned to court, the money would come back at the end of the case, the fund would revolve, and more bailed could be posted. Not only did The Bronx Freedom Fund's clients come back, the fund freed thousands of people. And most staggering, it proved how unfairly the American criminal legal system operates. "Money isn't what makes people come back to court. We know this because 96% of the people we pay bail for return, laying waste to the myth that money is what makes people come back. All you need are effective reminders of court dates." Not only is cash bail ineffective, it's dangerous. "We've learned that when held on bail 90% of people charged with misdemeanors will plead guilty, but when we paid bail, over 50% of cases were dismissed." In the history of The Bronx Freedom Fund less than two percent of their clients have received jail as a sentence. The Bail Project hopes to scale the success of The Bronx Freedom Fund, and they'll do it with the help of Bail Disruptors. A key component of the organization's strategic plan is to train and empower these individuals to aid and counsel clients who are bailed out — helping them to navigate their legal situations, even driving them to their court date when showing up is contingent on whether or not someone can afford a gallon of gas. What's more, many Bail Disruptors are formerly incarcerated individuals who know exactly what clients are going through. The Bail Project's ambition is to pay bail for 160,000 people over the next five years. They're already operating in St. Louis, Missouri and Tulsa, Oklahoma, and they're about to launch in Dallas, Detroit, and Louisville. They want to open 40 sites by 2022. Steinberg says this will be one of the largest non-government decarcerations of Americans in history. And if the results they're already seeing continue to scale, they will prove once-and-for all that the legal system as it currently exist needs to be dismantled because, as Steinberg puts it, "Freedom should be free." Her belief in the transformative power of the organization's mission is apparent when she talks about their long game — one that stands to make them obsolete. "I think about a legal system that's re-imagined and isn't a two-tier system. We want to put ourselves out of business. We want to end cash bail."